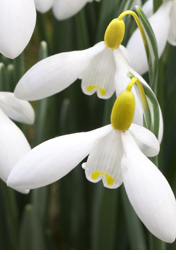 On Thursday 16 February at 14:40 after a bidding frenzy of over 30 bidders Thompson & Morgan, the Ipswich based mail order seed company, acquired the worlds most expensive snowdrop Galanthus woronowii Elizabeth Harrison for £725. This is a unique striking variety with a golden yellow ovary and yellow petal markings. The price is almost double the previous world record price for a single rare bulb of Galanthus Green Tear sold for £360 last year. Over the last few years the amount paid for unique Galanthus bulbs has been steadily rising as they have created more interest and in 2008 a single rare bulb fetched £226. Thompson & Morgan hopes to be able to produce this variety and bring pleasure to as many gardeners as possible. These unique Galanthus are notorious for their slow rates of multiplication but we hope to be able to look into commercial production via tissue culture, which will be the most time consuming and expensive part of the venture - buying the bulb was the easy part! When Thompson & Morgan purchased the worlds first Black Hyacinth Midnight Mystique in 1998 for £50,000 a bulb, it took 15 years before it was available to the general public and demand has always outstripped stock. We anticipate this beautiful snowdrop will create interest amongst enthusiasts and home gardeners alike, thanks to the snowdrop mania that has descended on the UK in recent years. What a welcome sight snowdrops can be in the first signs of spring. Last year we sold over 1 million snowdrops and have tried for many years to source the right golden variety in order to bring a wider range of unique snowdrops to the home gardener. The stunning snowdrop Galanthus woronowii Elizabeth Harrison was named after the owner of the garden where it first appeared as a seedling in a Scotland a few years ago and it has not been identified growing anywhere else. 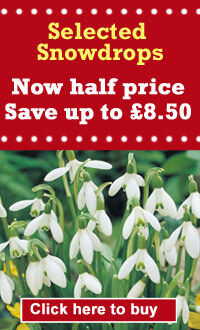 Click Here to buy Snowdrops now.